The start will be in Piazza Garibaldi, in the historic center of Monterosso. After passing along the seafront, the first ascent climbs the promontory of Punta Mesco, with a dominating view over the gulf of the Cinque Terre. 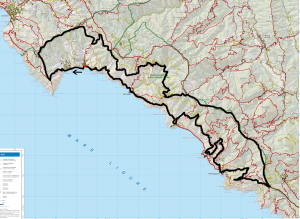 A stretch of “up and down” single track leads to “Colle di Gritta” with views of the coastline to the southeast and also toward Levanto to the northwest. After leaving “Colle di Gritta” a short segment of asphalt intersects with an old mule path to Soviore, the first sanctuary of the Cinque Terre (and one of the oldest). Another short segment of asphalt leads to a single track through mediterranean shrub with breathtaking views over the sea, which descends to the next sanctuary, Reggio. In the Reggio church square stands one of the oldest cypress trees in Liguria. 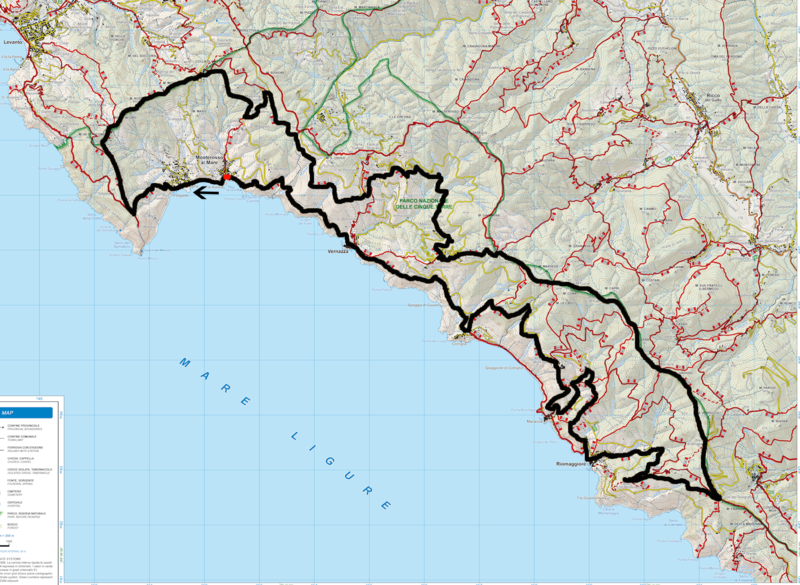 From Reggio the course climbs, via Drignana, to the Alta Via (high path) of the Cinque Terre. The “Alta Via” reaches the highest point along the SciaccheTrail course, Monte Malpertuso, at 750 metres above sea level, and continues on to “Colle del Telegrafo”, the furthest point west on the course. From here the course descends to the Sanctuary of Montenero and then to Riomaggiore, the first village of the Cinque Terre. A steep stairway leads to the vineyards of Corniolo, and then a single track continues on to the hamlet of Groppo, and inside the Cantina Cinque Terre, where the course passes alongside the steel wine barrels and modern winemaking machinery for the production of Sciacchetra’. From here the course descends to Manarola, the second village of the Cinque Terre. Another steep stairway, then single track, leads through terraced vineyards, then on to an old mule track bordered by olive groves, to the hamlet of Volastra and the Sanctuary of Our Lady of Health. This is the area with the highest concentration of cultivated vineyards, which best describes the Cinque Terre. From Volastra, a single track through the vineyards over the sea leads to Corniglia, the 3rd village of the Cinque Terre. From Corniglia the course follows the coastal “blue trail” through Vernazza, the 4th Cinque Terre village, and on to the finish line of the SciaccheTrail in Monterosso al Mare, the final village.